When it comes to confined space, the same popular questions seem to pop up time and time again, but if they are so popular, why do they keep resurfacing? Let’s break it all down and see how we can answer them. Let’s start with the basics: “What is a confined space?” A confined space, according to OSHA, is a space that is large enough for an employee to bodily enter and perform work, and has limited or restricted means of entry or exit and is not designed for continuous human occupancy. We have all heard this, read this, and been told this, but what does it really mean? It is any tank, vessel, silo, storage bin, hopper, vault, pit, manhole, duct, crawl space, pipe, or void that is not supposed to have a person inside it normally. This simple definition does not say anything about toxic atmospheres, engulfment hazards or anything else that could be dangerous and only states what a confined space is. In reality, it can be brand new, it may never have had anything stored inside, and it might hold drinking water or even be completely empty and yet still be classified as a confined space. Having a hazardous atmosphere inside of the confined space means nothing in identifying whether or not it is a confined space. From my understanding of other areas of the world, there is a similar thought process to what exactly is a confined space. Although there may be some differences, the overall concept appears to be that which OSHA identifies. After identifying the confined space, we need to assess whether or not the space is permit required or non-permit required. OSHA is pretty clear exactly what is permit required and what is not, but the simple question of “what makes your confined space permit required?” continues to surface. If any of these occur, your confined space is now permit required. I can tell you from experience that the majority of confined spaces are permit required, simply because the space contains or has the potential to contain a hazardous atmosphere. The key words to note are contains and potential. Contains means that it is present, it is in there or you know it is there. The word potential means that there is a possibility it can be in there or it could show up after entry has been made. Maybe it shows up due to the actions of the entrant and their work assignment through a chemical or cleaning process or hot work that depletes the oxygen. The last possibility for a PRCS is also one that makes many confined spaces become permit required. “If it contains any other recognised serious safety and health hazard” opens the door to many problems. This situation changes many normal confined spaces into permit required ones because of the types of injuries that can occur. Fire hazards, explosions, dust, extreme temperatures, slips and falls, and machinery also increase your safety and health exposures. While statistics have shown that many of the fatalities that occur in confined spaces are directly attributed to an atmospheric problem, the potential for serious injuries is also very real. After the decision and confirmation to re-classify the space has been completed, the employer must issue a certificate to be posted. This written certificate must provide the date, the location of the space and the signature of the person making the determination that the space is to be re-classified. This certificate must be made available to all entrants or their designated representatives. The lack of a re-classified space certificate is by far the biggest violation that I personally observe while working with employers. The objective is to have a confined space that is hazard free and that you are willing to put in writing that such exists and what you did to ensure that. I also want to point out that many confined spaces are not properly classified from the start, which would obviously make it very difficult to properly re-classify them. So now the real question is: “Is it possible to re-classify a PRCS? Yes, but I believe that it is very difficult and I also believe that the instances of occurrence are few. After figuring out the basics, rescue comes into play, as does the question: “So when do I need a rescue team at my confined space?” Rescue should first be addressed in the PRCS written programme. It is here that employees are given the details and requirements of the OSHA standard and also the company specific requirements for working in or around confined spaces. In reality, you cannot expect that OSHA is able to identify when specifically you need a rescue team. The OSHA standard is not so clear as to say that in this situation, rescue is mandatory, because each space is different. As for specifics on what the OSHA regulations say for rescue, you need to look at the preamble and interpretations. Looking at the requirements for a rescue team under Part K of 1910.146 should lead you to the direction of whether or not rescue is needed at your confined space. Your rescue plan needs to identify whether it will be a self-rescue, assisted rescue or entry rescue. OSHA also makes it very clear that entrants should leave the space if they detect a problem or prohibited condition or even if directed to leave. This is self-rescue. It is also very clear that a mechanical retrieval device is required for entrants in PRCS that are deeper than five feet vertically. If employees are aggressively monitoring and working in a confined space correctly, the employee should receive ample notice as to when they must exit the space under their own power. A self-rescue must proactively look at providing aggressive air monitoring and detailed permit completion for all spaces. This is the true meaning of self-rescue. “How can I perform a rescue?” If the entrant is hooked up to a mechanical retrieval device and something goes wrong, the attendant can retrieve them from the space without making entry. We have just bypassed the proactive approach and are now in a reactive state. This is called assisted rescue. Assisted rescue is only going to work if the entrant remains hooked up to the retrieval device and there is the ability to retrieve them safely. Attendants should not be making entry during an assisted rescue due to the fact that both the entrant and attendant would be exposed to the same possible hazard. The final option and last resort is where something catastrophic has occurred and a rescue team must make a physical entry in order to retrieve the entrant. This is a go rescue, or entry rescue. A go rescue must be a last step effort as it is a very dangerous activity requiring extensive training, practice and equipment. You are talking about putting another worker into an already dangerous situation to retrieve the original entrant from a hazard that already should have been addressed. A key thing to remember is that both assisted and entry rescues involve a very real problem. There are hazards, there are problems, there is danger and your entrant is in the middle of it – don’t make it worse! With an entry rescue, your entry team is placed in the middle of the same mess and as such is exposed to some deadly situations. Ideally, we should not want to make entry, we should want to bring the person out of the space, to us and to safety. If self-rescue is not an option and a worker must be assisted out of the space, how can it be performed if the worker is not connected to a retrieval device? OSHA mandates that, in a PRCS deeper than five feet, there is a means of mechanical advantage to retrieve a worker, yet in my experience many workers immediately disconnect from their tether once inside. Why? I hear such excuses as “I didn’t want to be tied down”, “it hindered me from working” and “it kept getting tangled around me”. It may be uncomfortable to be tethered all the time, but failure should not be an option. Rescue options are really limited if the worker is disconnected, but one possible way to reconnect a retrieval system is to use a reach pole. Some companies make rescue poles that use a carabineer to connect the retrieval device to the entrant. The carabineer and pole can be lowered into the space and using the open carabineer you then simply snag the D ring on their harness. It’s not always easy, but it is a tool in the box and prevents a rescuer from having to make an entry. What is your plan to prevent an employee from disconnecting while making entry? Have you practiced your plan? What about your PRCS written programme, does it address disconnecting? OSHA says an entrant can only disconnect when it creates a greater hazard. Is it really a greater hazard to be inconvenienced, or to die? Unless you want to traverse into an entry rescue, do not allow your entrants to disconnect. Ever. “What is required with a permit?” No one likes paperwork, but this is one time that a worker should not skimp on procedures. A permit should always be filled out, since it is a true checks and balance approach to safety. It documents what you did and also what you are currently doing. Use it as a checklist to ensure that you have covered everything correctly and that you did not miss something. The permit asks questions and based upon the replies it should lead you to a safe solution. The permit must be posted at the point of entry for all those involved to see. Sadly, I see many occasions where a permit is not available and also when it is not completed properly. In the OSHA regulations, employees and their representatives are given the option of observing monitoring and they also should be involved in the permit completion process. I always ask employees involved in confined space work what was on the permit. Who is the entrant? Who signed the permit? What special equipment do I need, or procedure must I do? What are my atmospheric readings? The permit is a living and breathing document that is continually updated as new monitoring data is obtained. OSHA minimally requires the permit be updated every two hours, but requires the monitor running continuously while in a PRCS. I strongly encourage the permit to be updated every 15 minutes showing the atmospheric results so that any change in conditions can be quickly identified. It takes less than 10 seconds for an employee to look at their monitor, give the results verbally and transcribe that data to a sheet. Remember, if you will, that it is a living and breathing document. Atmospheric monitoring is a vital part of the permit process and should be the first step to properly evaluate a confined space. “So what does air monitoring require?” OSHA requires that atmospheric monitoring be performed initially and just prior to entry. Initial monitoring is to perform a thorough assessment of the space and to evaluate all the possibilities that may be in the space at the very beginning. The check prior to entry is completed after the initial and just as implied, prior to entry. This test is to give a final check to ensure that the air is safe for entry. The reality is that some time has elapsed since the initial monitoring and making entry, so there needs to be a quick check to ensure that it is still safe. It is also required to check for oxygen levels first as it is the primary source of life. Secondly, we check for flammable gas or vapours since those things can explode or engulf the space in flames. Lastly, we check for toxic hazards such as carbon monoxide, hydrogen sulphide, sulphur dioxide, and nitrogen. The real hazard within confined atmospheres is that gases are invisible. Air looks like air. It is clear, without recognition and very much an unknown. The only way to know if a hazard exists in the atmosphere is to monitor it, since we cannot see if the air is hazardous. Another requirement is that the space must be monitored every four feet both vertically and horizontally. Think of a bubble around the monitor – that is what it is reading, not the entire air space. Take the readings and then move to that level and take additional readings. Monitor, move. Monitor, move. Another problem with air monitoring is the response time of the manufacturer. How long does the manufacturer require air to draw across a sensor in order to give an accurate reading? What if you are using a sampling hose of 20 feet, how long will it take now? What about with a battery pump verses a hand pump? These are all things that must be considered within the atmosphere in order to give an accurate understanding to those in or around a confined space. 1. Continuous air monitoring should be performed in all confined spaces and not just in a PRCS. We cannot determine any change in the atmosphere if we are not monitoring it continuously. I believe this to be the first priority in confined space work and the one task that offers the best level of employee protection. 2. All entrants into a confined space must be hooked to a mechanical advantage retrieval system at all times. When something goes wrong, no one has the ability to magically attach the retrieval device to a downed entrant and bring you to safety. 3. 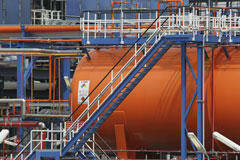 Fresh air should be provided in all confined space entries and that supply needs to be monitored to ensure it is safe. Simply creating a positive pressure atmosphere in the confined space can help keep contaminants from creating a problem. Just remember that rubbish in is rubbish out so know the air source. 4. All entrants should have with them an emergency escape air bottle to allow them the ability to self-rescue and have the time to do such by the provided breathing air. These simple devices can provide either five or 10-minute air bottles. Its use is simple enough – it is deployed with a bag pulled over the entrant’s head and provides fresh air for escape. Remember, a typical person can only hold their breathe for around one minute. So, how far can you climb, run, crawl or simply wait? 5. If all confined spaces had a written permit filled out and had that permit posted at the point of entry, it would allow workers to know the dangers of their work. Remember, OSHA requires permits to be completed before an entry occurs. All workers involved with the entry should be aware of what the permit requires and the hazards that it may identify. I often ask employees in confined space work what the readings were, what time they started taking them, who signed the permit and what equipment is necessary to do the work. What do you think is the response? Sadly, they have no idea what the answers are. Like lambs to slaughter, so too are workers sealing their fate. We have covered a lot of things here regarding confined spaces and safe working in those confined spaces. Now that you understand some things better, are confined spaces dangerous? Yes. Confined spaces can be very dangerous work areas and sadly, employees are not widely trained to even recognise the hazards all around them. Employers must do their part and educate employees on the hazards of their work, but also make every attempt to remove the hazards before exposing workers to them. Once exposed to the hazard it is too late. Confined space work does not have to be as hazardous as we tend to make it seem as long as there is purposeful questioning of the whats, hows, whens and whys of safety. No one wants to have an injury to an employee or worse yet, a fatality, so we all need to do a better job and implement preventive measures when working in or around confined spaces. The danger is real and kills many would be rescuers each year. We look into the space and it looks fine, seems ok, nothing appears to be abnormal. It is only when we make entry that we realise that something is definitely wrong. Then what? Be safe always.